"This recipe was originally an appetizer I offered in a downtown Boston bistro, but when I saw the mass appeal for it, I quickly remade it as a main dish. It remains one of my most popular sandwich dishes to this day. It is surprisingly simple and quick to make." Stir beef, Worcestershire sauce, and Montreal steak seasoning together in a bowl. Marinate beef while preparing other items. Heat olive oil in skillet over high heat. Cook and stir onions in hot oil until golden brown, about 15 minutes; add balsamic vinegar, salt, and black pepper. Reduce heat to low and cook the onion mixture at a simmer until there is little liquid remaining and the mixture is syrup-like in texture, about 10 minutes. Preheat an outdoor grill to 400 degrees F (200 degrees C) and lightly oil the grate. Remove steak pieces from the marinade and shake off excess. Discard the remaining marinade. Combine beef and canola oil in a bowl and toss to coat. Cook the beef slices on the hot grill, turning frequently, until they start to firm and are reddish-pink and juicy in the center, 4 to 6 minutes per side. An instant-read thermometer inserted into the center should read 130 degrees F (54 degrees C). Arrange rolls onto a baking sheet. Spoon onions into the bottom of the sandwich rolls; add beef. Top beef with Brie cheese. Heat in preheated oven until the cheese melts, about 5 minutes. See how to make the pride of Western New York, the Beef on Weck sandwich. It is possible to create an appetizer by slicing baguette into 1/2-inch slices and toasting them to a golden brown. Instead of using cubed beef, cook the entire roast at 250 degrees for 35 minutes, allow to cool, and slice thinly, using a very sharp knife or a slicer. Cut those slices into strips or pieces. 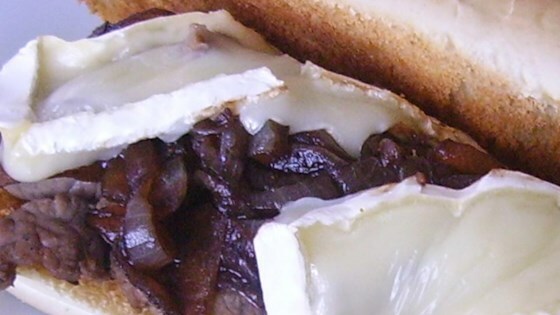 Layer the onions, beef, and finally the brie on top and broil briefly for finger-food appetizers.